“WTF?” you exclaim, in astonishment and horror. Turns out that there is a recall on this dishwasher for a problem with the rinse aid dispenser. 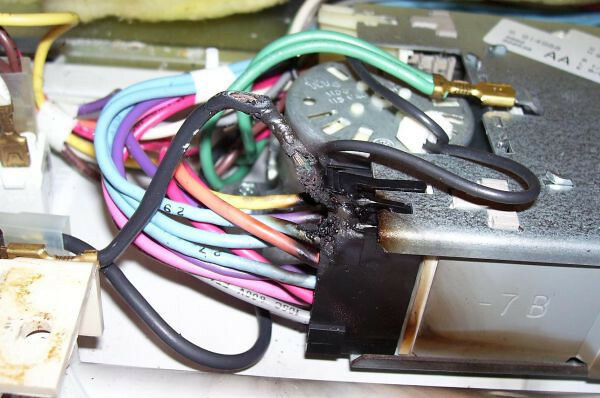 Although the depicted problem was not caused by this, but was instead due to loose connections at the timer wire harness, there’s still a good chance that Maytag will cover it for you. Worth a call, right? Here’s the number to the Maytag Recall Team: 1-800-675-0535. And in case they don’t cover it, here’s the part link to the timer if you want to replace it yourself. Easy job, half a mug on the world-famous SUDS-o-meter. This entry was posted in Dishwasher Repair on July 30, 2008 by Samurai Appliance Repair Man.